Map, XUYEN MOC (SW), Sheet 6430-11-SW, VIETNAM, Edition 3-AAS, 1:25,000. Time Zone used throughout the report: HOTEL. 1. During the years that 103 Sig Sqn and 104 Sig Sqn have supported 1 ATF in South Vietnam, patrolling has become a part of unit life. With other supporting and administrative units within the Task Force base, Signals have regularly provided patrols to take their share of the responsibility of maintaining base security. 2. The patrols mounted by the minor units are tasked and controlled by a fostering infantry Battalion. In the case of 104 Sig Sqn this association is now traditionally established with either 2RAR, 4RAR or 6RAR. 3. 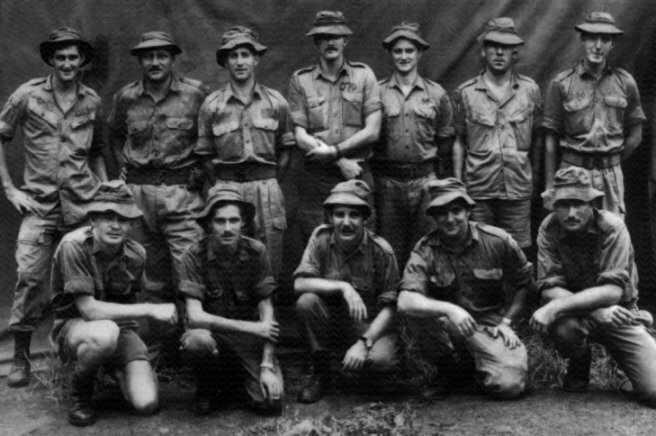 During April 1970, 2RAR/NZ (ANZAC) relieved 6RAR/NZ (ANZAC) and 104 Sig Sqn settled down to a patrol program under their guidance. Generally, the basis which 104 Sig Sqn accepted entailed the provision of two 12-man patrols each month. Each patrol was of one to two days’ duration. who had been with earlier patrols into the same general area. that the previous day's pattern was to be repeated. 7. After moving only 100 metres the reconnaissance group heard the noise of movement from the east. The group returned to their temporary defensive position and found that some of the other members of the patrol had observed movement on the ridgeline, approximately 150 metres to the east. After confirming the sightings the patrol commander engaged the movement with Artillery and prepared the patrol for a sweep of the area. At this stage a clear sighting of from seven to ten of the enemy was again observed on the ridgeline and at 1646 hrs the area was engaged by the whole patrol using M79, GPMG M60 and rifle fire. The patrol again called for and directed Artillery fire onto the area. 8. At approximately 1700 hrs two “Bushranger” gunships were offered by 1 ATF CP. Five minutes later they were covering the patrol and engaging the enemy on the ridgeline. Their assessment of enemy strength suggested that the patrol could be opposing a force of “up to 20”. 10. At approximately 1720 hrs the patrol received both automatic and small arms fire from the southeast. The “Bushrangers” immediately directed their attention to this area. Five minutes later small arms fire was received from the north and the enemy released smoke in an attempt to confuse and divert the gunships. Their plan was unsuccessful. 11. When the patrol came under fire from the northwest at 1728 hrs, the patrol commander realized that the enemy was attempting to encircle them. At this stage fire from the east had ceased, and fire from the south of their location seemed highly probable. The patrol commander decided to break contact and withdraw, by fire and movement, to the southwest. After withdrawing for approximately 150 metres the patrol turned south, keeping abreast of the track. 12. When some 500 metres south of the contact area the patrol established a defensive Position, with good fields of fire, in the rubber. Accurate fire continued to engage the patrol from the vicinity of YS 481681 and movement was heard from the east. When they withdrew further south to YS 477674, enemy fire became inaccurate, going well above the heads of the patrol. 13. At 1740 hrs a "Possum" rotary wing aircraft joined the "Bushrangers" overhead and, whilst the gunships held out of the area, the "Possum" pilot directed artillery fire onto the enemy follow up route. 14. The patrol commander then directed his men to YS 473659 where an RV had been established with APCs, which had been dispatched from Nui Dat. On their way to the RV the patrol sighted and engaged two more enemy, but the enemy broke the contact and were not seen again. A platoon size reaction force, mounted in APCs, was dispatched by 7RAR from the Horseshoe during the contact. An immediate sweep of the contact area and a further sweep conducted by this force at first light 5 Jun 70 failed to locate any enemy. 15. RV with the cavalry was established at 1810 hrs and the patrol was safely extracted and returned to Nui Dat. 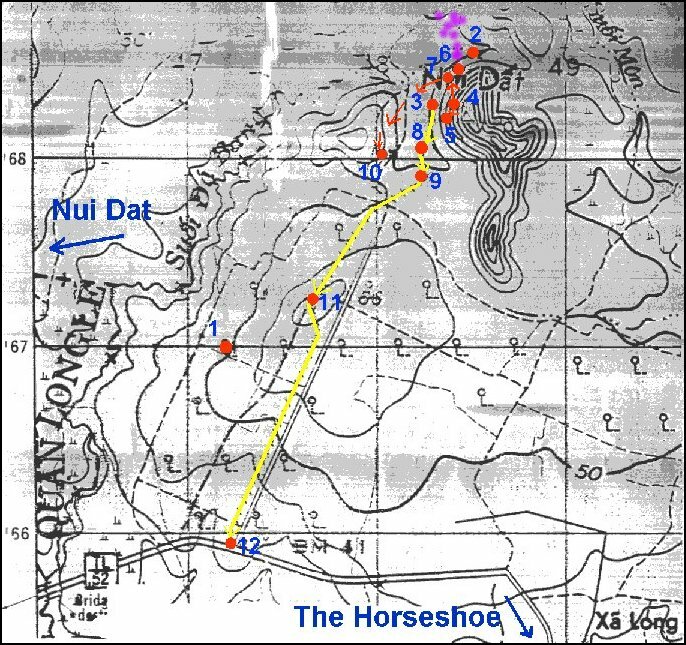 In spite of its premature extraction the patrol had completed its mission successfully and, by flushing the enemy from his prominent sanctuary, had not only provided 1 ATF with a good deal of valuable information, but had possibly pre-empted enemy plans for offensive operations against Nui Dat. 16. This is believed to have been the first base patrol mounted by the Task Force Signal Squadron at Nui Dat to have had an enemy contact. It may not be the last. 17. The patrol commander speaks very highly, and somewhat proudly, of the members of this patrol. He points out that "by strict adherence to his orders, sound control of fire and expeditions use of fire and movement" the patrol was able to extract itself from a situation where the "odds" were by, no means in their favour. 18. Just as important, the members of the patrol now clearly realize just how much timely support awaits their call and that, in a situation such as this, they can be confident that they will receive it. They now understand the significance of a term that had been driven into them for many months – TEAM EFFORT. 19. Finally, this experience emphasizes the need for all members of Signals to remember that, they are serving with a fighting arm and that the techniques of infantry minor tactics and patrolling cannot be neglected. A. Map of Contact Area. L-R (Top Row) L/Cpl Brady, WO2 Huston, Sgt Martin, Cpl Scheinpflug, Sig Rose, Sgt Reeves and Cpl Churchill. L-R (Bottom Row) Cpl Robertson, Sig Lake, Sig Emmanuel, Sig Bell and Pte Hallis. This was not the only 104 Sig Sqn patrol shot at. 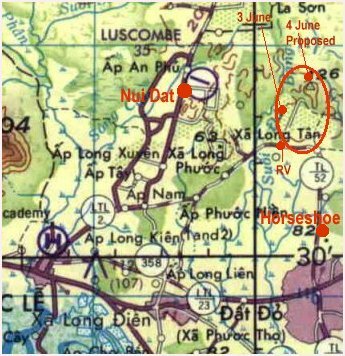 On the 28/29th Nov 1970 the unit conducted an ambush and recce patrol (Callsign 45) east of Hoa Long (YS 4263). The ambush position was at YS 437635. During the morning of the 29th Nov the patrol came under sporadic fire from YS 435639 by a single-shot weapon. After receiving clearance, the patrol conducted a long sweep to the north and west of their search area in an attempt to contact the firer. The firer withdrew rapidly, marking his withdrawal route with continuing single shots. Contact was not made. have photos that I can add to this Web Site, please email with details.